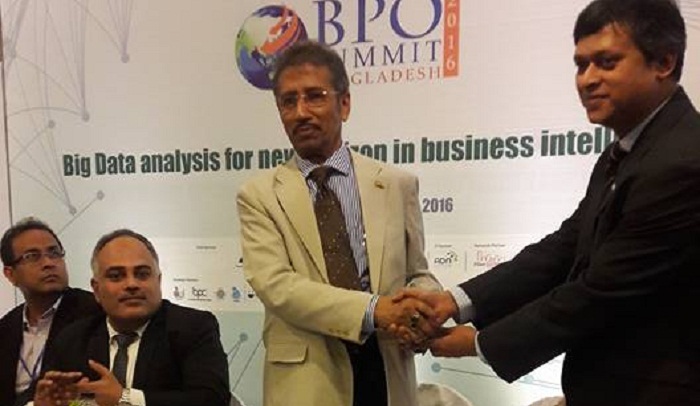 A two-day long international conference on ‘BPO (Business Process Outsourcing) Summit Bangladesh-2016’ jointly organized by the Department of ICT and Bangladesh Association of Call Centre and Outsourcing was held at Pan Pacific Sonargaon Hotel, Dhaka recently. Professor Dr. M. Shah Nowaz Ali, Member, UGC and former Chairman of Board of Directors, Rajshahi Krishi Unnayan Bank (RAKUB) graced the function as the Chief Guest. Twelve sesions were held in the conference where twenty international IT experts shared their experiences. Dr. Badrul Munir Sarwar, Machine Learning Scientist, Linkedin presented the keynote paper. Faisal Quader, President and Co-Founder, Technuf, Raj Mohan Vairamuthu, Managing Director, CNCData. LLC, Zian Shah Kabir, Engineering and Operations, BTRC and Arijit Chakraborti, Executive Director, PwC Bangladesh, among others spoke on the occasion. Professor Zeba Islam Seraj, Dhaka University moderated the sessions. High officials, university students, journalists and concerned offcials from BPO company and local and international BPO were present. Professor Shah Nowaz highlighted the various success stories and prospects of ICT sector in local and international markets of the country. Terming the BPO sector as very important one, he expressed his optimism that BPO sector will be able to create employment opportunities for huge number of people in future.